In his headier and hunkier days, Arnold Schwarzenegger spoke boldly about how “failure is not an option.” This kind of bravado worked well in the gym–and in a remarkable career that saw an inarticulate Austrian body-builder rise to the apex of Hollywood and California politics. But Schwarzenegger’s soon-to-be-ended seven-year reign as California’s governor can be best described in just that one simple world: failure. It has been so bad that one even looks forward to having a pro, the eccentric Machiavellian master, Jerry Brown, replace him. Schwarzenegger never grew beyond the role of a clueless political narcissist. As the state sank into an ever deeper fiscal crisis, he continued to expend his energy on the grandiose and beyond the point: establishing a Californian policy for combating climate change, boosting an unaffordable High-Speed Rail system, and even eliminating plastic bags. These may be great issues of import, but they are far less pressing than a state’s descent into insolvency. The Terminator came into office ostensibly to reform California politics, reduce taxation and “blow up the boxes” of the state’s bureaucracy. He failed on all three counts. The California political system–particularly after the GOP’s November Golden State wipeout–is, if anything, more dominated by public employee unions and special interests (including “green” venture capitalists) than when Gray Davis ruled. Taxes, despite efforts by members of Schwarzenegger’s own Republican Party, have steadily increased, mostly in the form of sales and other regressive taxes. The bureaucracy, with its huge pension costs, continued to swell until this year even as state unemployment climbed well over double digits. Schwarzenegger’s fiscal street cred was undermined by his support for unessential new bond issues for such things as stem cell research and high-speed rail. He threw financial prudence out the window in order to appease his business cronies and faithful media claque, particularly those working for mainstream eastern media. Looking back, it seems difficult to remember that Schwarzenegger’s election initially thrilled the business community, who saw him as a counterweight to the dominant axis of unions and green zealots. “An army of entrepreneurs,” as I wrote around the 2003 recall, rallied around a self-made man who seemed to understand the challenges of running a business. In the end Schwarzennegger failed these California optimists miserably. He ignored the impending crash of the state’s real-estate-driven “boom” and instead waxed lyrical on California as “the new Athens and Sparta,” destined to lead not only the nation but the world “into the future.” Sadly, a more apt classical analogy might be Carthage–except the burning and salting of the California has been committed by its own leaders. Today few governors, much less foreign leaders, would regard California’s government as anything other than a cautionary tale in colossal mismanagement. Many others, particularly newly elected Republican governors, regard the state’s persistent mismanagement as a mega opportunity for poaching jobs and companies for the benefit of their constituents. This delusion has failed to materialize. Silicon Valley’s venture capitalists, the much celebrated architects for a creative revival, increasingly seem a spent force, investing fewer funds with less success than a decade ago. 2009 saw fewer new venture fund financing than in any year since 2003, while actual dollars raised have been dropping since the late 1990s. And for all their self-importance, the venture capitalists are hardly the game-changing visionaries of the past; instead, they seek federal subsidies or back social networking start-ups that provide far less in the way of employment prospects than legendary successes like Intel or Apple. The Google-Facebook economy has wowed the business media, but their direct impact on jobs is largely concentrated in a few affluent areas around Palo Alto and parts of San Francisco. Despite the celebrations of these companies, much of the more decidedly middle-class parts of the Valley remain in a deep recession, with over 15 empire state buildings worth of empty space. Of course, apologists point out, quite correctly, that many signature corporations are keeping their headquarters in the Golden State–after all not many CEOs are anxious to leave the climatically blessed environs of Atherton, Palo Alto, San Diego or West Los Angeles for a new life in Salt Lake, Shanghai or even Austin. But these same CEOs are shifting manufacturing, tech support and. increasingly. research at a rapid clip to places with lower taxes, more accommodating business climates and a better chance for the non-filty-rich to live a good life. This slow but steady leakage is draining the state economy. California’s share of the nation’s jobs and national income continues to drop. In the last seven years, California has underperformed the nation in generating both middle-income and tech-oriented jobs. Unemployment has remained two points or more higher than the national average. The draconian greenhouse gas reductions now proudly touted by Schwarzenegger could make this worse. If the nation was following similar regulations, something conceivable prior to the November elections, the pain may have been more equally shared and an aggressive stategy aimed at “green” industries could more likely have proved a decent bet. Now companies in California and a handful of other similarly minded states simply will have to cope with regulatory overkill and much higher energy costs against competitors domestically and around the world. The production sector, the most vulnerable target of the green machine, is already reeling. Manufacturing losses, over 32% since 2001, have remained well above the national average–with a toll of over 600,000 jobs . Over the last three years the state ranked dead last among the nation’s 25 largest states in terms of adding new manufacturing capacity. This, of course, has had little impact on those who inhabit the upper echelons of Hollywood or Silicon Valley. Arnold’s failure has been toughest on California’s working and middle classes, the very people who once saw in him a savior. Now, in an act of what seems like desperation, Californians have brought back that quirky dinosaur, Jerry Brown, who at least one can never call either stupid or naive. Brown’s campaign scored well by linking his amateurish opponent, Meg Whitman, to Arnold’s patent lack of political savvy. 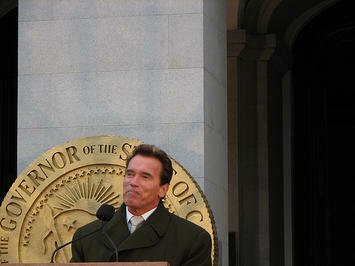 Brown recognized that Schwarzenegger had done a great job in discrediting both himself and the state GOP. The Terminator, who once enjoyed a 65% approval rating, suffers the lowest popularity rating of any California governor in the past 50 years –a dismal 22%, according to the latest Field Poll. Six in ten Californians now think Schwarzennger is leaving the state in worse shape than he found it, and they are right. So what do you call a star who has lost the admiration and support of his fans? There’s just one word in this script: failure. Submitted by zion1122 on Sun, 08/25/2013 - 05:55. Submitted by zion1122 on Wed, 08/21/2013 - 09:02. Submitted by ritansam123333 on Sat, 03/02/2013 - 14:34. Submitted by Robert Kessler on Mon, 12/20/2010 - 21:52. Mr. Kotkin's observation to Dennis Prager that Gov. Schwarzenegger suffers from inescapable narcissism is the answer in a nutshell. He is the product of a sport and a career that feeds ego over substance. I had doubts from the beginning that he had the personality to choose a course that while necessary, would have guaranteed negative press and public opinion. I'm sure the Governor expects to return to a film career when he leaves office; I'm not surprised that he's most concerned with protecting his own brand. California is a state in which counterculture ideas of socialism, pseudoscience and mysticism have permeated the populace and the running of the government itself. Dennis Prager also interviewed Congressman Henry Waxman (D CA) some time ago, and asked him the simple question "Is there some point at which the level of taxation begins to damage the economy?" To which Mr. Waxman replied "Well Dennis, I've never thought about it." Submitted by rich_b on Fri, 12/17/2010 - 12:39. What is it going to take for California to finally hit bottom? It hasn't happened yet, liberal voters have their heads so deep in the sand of denial. When it does happen, things are going to be so bad, its going to be really tough for it to dig out. The rest of the country is in no mood to bail out California (plus it can't afford to anyway). So it will have to be done by California on its own. Giving them money will only ensure they don't reform, so they should be left to do this on their own. I never had high expectations for Schwarzennegger. He doesn't have very many conservative or even Republican beliefs. To be honest, he wouldn't be a Republican anywhere else in the country. He chose to not battle the liberal Democrats that run that state, instead of being like Governor Christie of New Jersey. Many (including many businessmen) thought he would be like Christie is now. But he wasn't, and only someone like Christie is going to be able to change the bad habits of California. California chose Moonbeam, so the next four years will be the same, more decline for California.